Generate an HTML calendar that visitors can view, print and subscribe to with RSS. 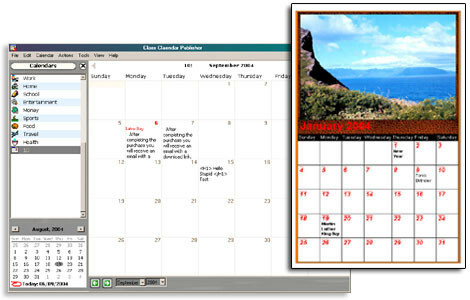 Ideal for keeping a company, school, church event calendar online. For a teacher to track and publish printable course calendars or a coach to keep a sports team schedule online. The calendar wizzard lets you use custom photos,textures and fonts. FTP is built-in and you can update web site with one click using. Attach files, and publish with iCal and RSS feeds. Apple's iCal application allows you to publish your calendars so anybody can view them on the web. Powerful Schedule and Appointment Database with Calendar printing! Mom`s Calendar provides a simple printable calendar that is great for keeping track of events.